In order to help you improve your visualization as well as observation skills, Some training exercises in the form of solutions for previous CEED exam questions were given with appropriate tips and tricks (where ever required). Hope it will help you for your exam preparation. For your convenience and practice, I had drawn both the pieces. But you need to draw only one piece in the exam. The hidden lines were shown in dash for your better understanding. You may go through four of my visualization that I draw using the line. The first illustration visualize a tea pot. The second illustration visualize an old western musical instrument. The third illustration visualize a flower. The fourth illustration visualize an Interior home decorator. 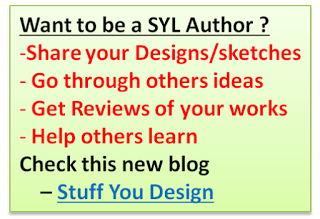 You may also see some more similar ideas for your further information. Ladies skirt, water jug, elephant trunk, leaf, trisul and human nose can be seen in the below pictures. Below is an image of a triangle with some pattern on it. This triangle is mirrored four times as shown below. Draw the correct position of the pattern on the last triangle. To visualize this type of questions, you need to fix the direction of mirroring. For your convenience; I gave numbers to the triangles in the order of mirroring as shown below. 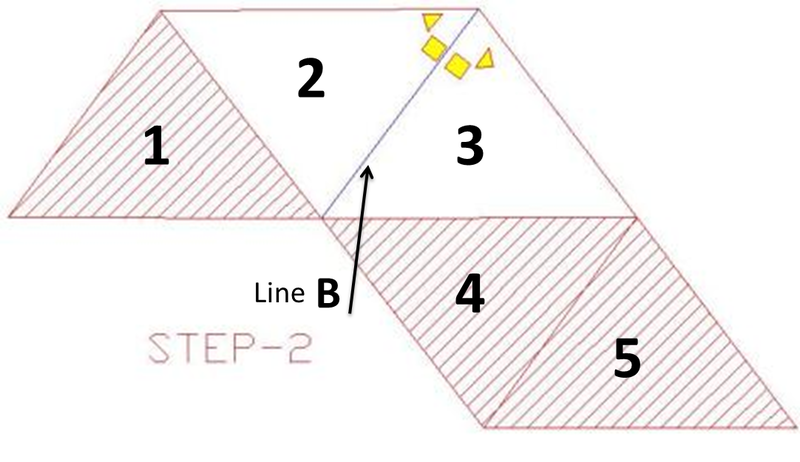 For the first reflection; you need to consider only the main triangle (numbered 1) and the immediate first reflection (numbered 2) as shown in STEP-1 above; forget about the remaining two triangles (numbered 3, 4 and 5). Reflect the smaller objects in the triangle by assuming the common edge for the two triangles (i.e line A) as mirror base. You should get the reflection as shown in STEP-1. 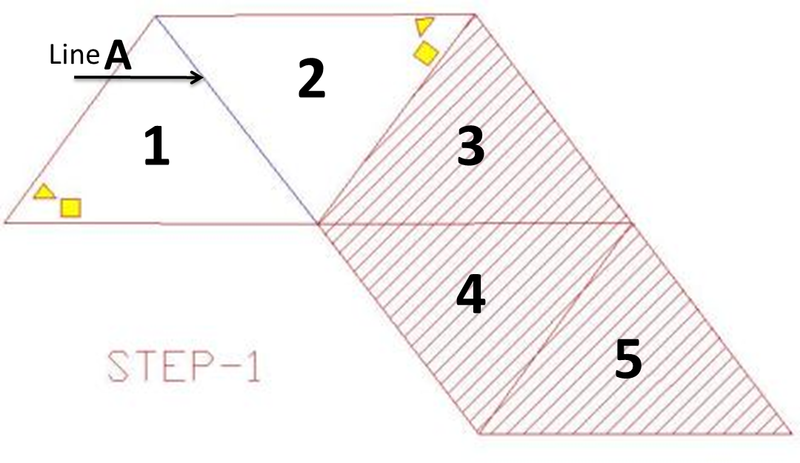 After doing this, to get the next reflection; apply the same thumb rule i.e considering only the first reflected triangle (numbered 2) and the next immediate reflection to be carried (numbered 3). Forget about triangles numbered 1, 4 and 5. Make the common edge (Line B) as mirror base and reflect the smaller inside objects to get reflections as shown in step - 2. Now, by applying the same principle, you should get step-3 and step-4 as shown below. You should be doing this mentally (without the use of paper or pen) to get better visual power. OK, this post is getting bigger, so I will include more examples regarding this topic on Part-2. Can you please send me the link of previous year qes. Papers of NID? prev years papers for NID are not available. Indian preferably, if u find time, extend to world renowned architects.Don't stuff ur brain with too much info btw. That might confuse. Just a suggestion. thankyou very much sir for the questions for preparation of the exam sir ,this blog really helpful to and given more guidance than and other institute. sir ,can i get more questions for practice because i'm not getting any idea about proper structure of exam and date is near .hence i dont have any confidence for exam to appear with !plz guide me for this situation . I've already included a good no. of practice ques in this page. For getting to know about the structure, I suggest you solve recent previous years papers. Also, check the timetable that I shared along with Part A resource page. These materials might help you give what is imp and what is not.